Secular Italian-texted music from a German Lutheran composer better known for his German-texted sacred music is not as much a contradiction as might first appear. Like many musicians before and after him, the 24-year-old Heinrich Schütz spent time learning his trade in Italy; in the case of some of his sacred music it’s difficult to be sure exactly what he composed and what he transcribed from Giovanni Gabrieli and Claudio Monteverdi. 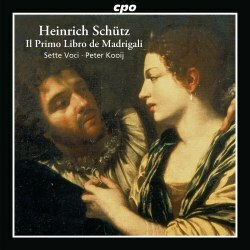 He published this collection of madrigals as his Op.1 in Venice in 1611. Though described as the first book, there seem to have been no successors, so this makes an attractive pendant to his sacred music. - Harmonia Mundi HMG501686: Cantus Cölln/Konrad Junghänel, a recent reissue at mid-price of a recording first released in 2000. You can compare these with the new recording from the Naxos Music Library. The Dresden Kammerchor sing well but, as Johan van Veen points out, the employment of a choir in this music is quirky to say the least. Cantus Cölln give a much leaner-textured and more enjoyable performance. You’ll also find two recordings there which are not available on CD in the UK: Hannover Orlando di Lasso Ensemble (Thorofon CTH2387) and Capella Lipsiensis, Berlin Classics 0021022); all five of these recordings, including the new CPO, are available for download from classicsonline.com in mp3 but CPO downloads from that source tend to come with only a truncated version of the booklet, devoid of texts. Worse, though there are lossless downloads of the CPO and Carus recordings at an attractive price from eclassical.com, the all-important booklet of texts is not part of the deal, even in truncated form. The themes of these madrigals will be familiar to anyone who knows the Italian models, Monteverdi et al - the coming of Spring, the sweetness of love and the bitterness of loving in vain. Lost love is always more bitter than never to have loved at all and the outcome often presages the death of the lover. Schütz’s main source is Guarini’s pastoral collection Il Pastor fido - nothing, surprisingly, from Petrarch - but he may have composed the text of No.19 himself: it’s addressed not to a beloved but to his patron, Landgraf Moritz, Italianised as Gran Maurizio. Sette Voci are a small ensemble - actually there are nine singers on this recording, so their maths, like that of The Sixteen, is a bit approximate. They are very lightly accompanied by violone, chitarrone and keyboard (harpsichord or organ). I enjoyed their performance of these works as much as that of Cantus Cölln. You may be attracted by the price advantage of the latter but I see that at least one online supplier is offering the CPO CD for around the same price. Schütz’s sacred music is one of the delights of its period and while I can’t claim that these madrigals quite equal it, they are well worth getting to know in these performances. The recording matches the bright, fresh sound of the singing and the booklet of notes and texts is informative, though printed in a small font.